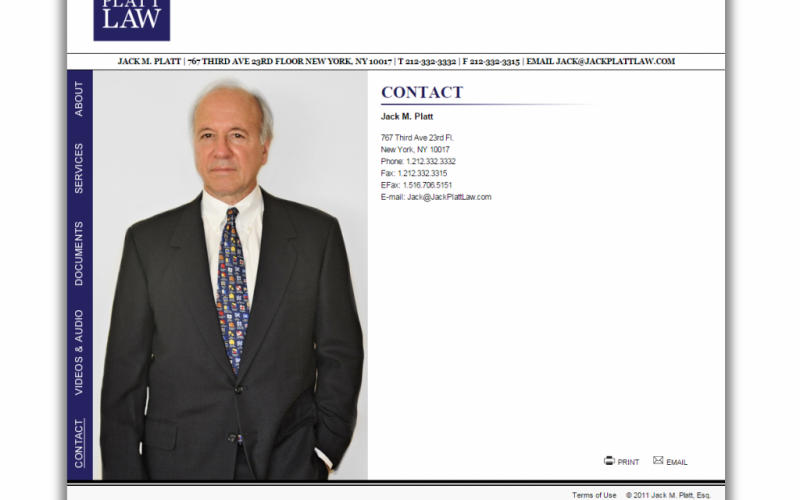 Jack L. Platt needed a new website for his law firm, Jack Platt Law. Mr. Platt contacted Union Square Design and explained his individual needs for the site. He asked for one main thing: to be able to share documents on the site — to others as well as to himself. Jack Platt Law focuses in all aspects of corporate law, and specializes in mergers & acquisitions. 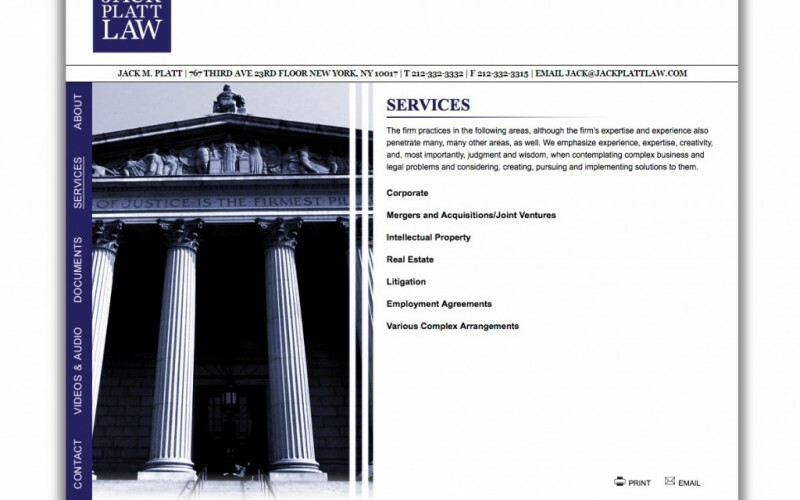 In addition to his firm, Mr. Platt is also a professor at Hofstra University School of Law, which requires him to share course materials. 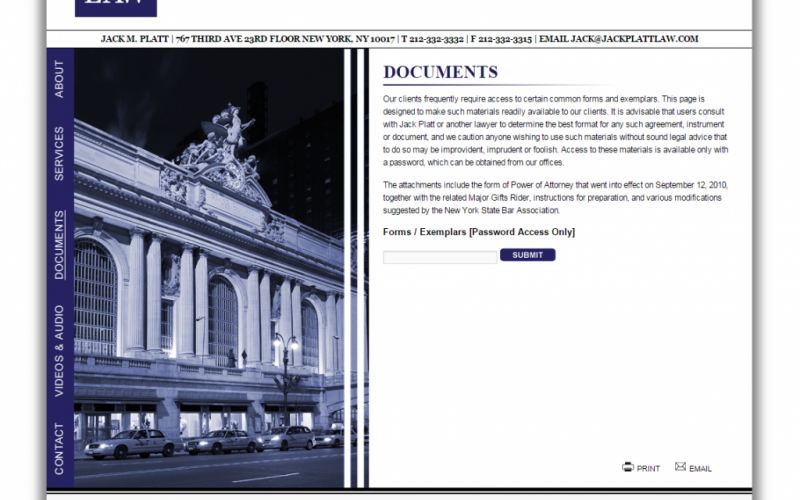 Because Jack Platt needs to share documents with his prospects, clients, and students, Union Square Design proposed to create a password-protected login portal for his site. This login portal allows Jack Platt Law to easily manage materials, and make them selectively available to different audiences. This secure portal can support any form of media, which was important as the law practice utilizes a lot of video and audio files from Mr. Platt’s public appearances. This posed a unique challenge for the website, which we were able work out. The website we created for Jack Platt Law also allows documents to be uploaded and transmitted to Jack Platt in a secure and organized fashion. As professor and active member of the community, Mr. Platt has had numerous impressive appearances that have been recorded. These recorded sessions can be accessed and shared through the website with prospects, clients, and students as needed. To do all this, visitors need a login password, which would be given to them by Jack Platt. 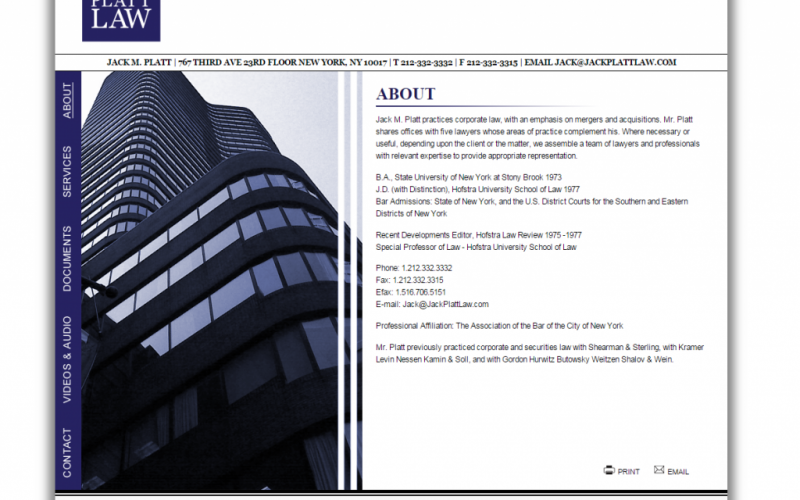 The Jack Platt Law Firm specializes in corporate law with an emphasis on mergers and acquisition. The law firm is also partners closely with five other lawyers whose areas of expertise complement his specialization. You can read about his services on his site. We created a website for him which highlights the company profile, while meeting the unique requirements of providing a secure login to access documents.